Core Business – Book printing service is core business area of Repro India. It has plants in Surat, Navi Mumbai, Bhiwandi, and Chennai. It prints books for clients in India as well as abroad. Knowledgecast – It is a content aggregator service. It bridges gap between publishers and content readers. It delivers book through online channels as well as offline channels. Rapples – Rapples is preloaded educational tablets with books. It can be as per School curriculum. So teachers can use it like book and also plan their approach through out the year. If you look at above business area of operation you can clearly see that company is trying to woo customers in both offline segment as well as online segment. With growing focus on tablet based education system company has come up with Rapples solution. For traditional education system it has the core business of printing books going for it. The core business gives it reach with different publishers across the globe. This will help the company with Rapples as well. The same publisher materials can be made available in Rapples tablets as well. Above discussion have given you insight into area of business operation. Now lets have a look into the stock performance of the company since the IPO days. 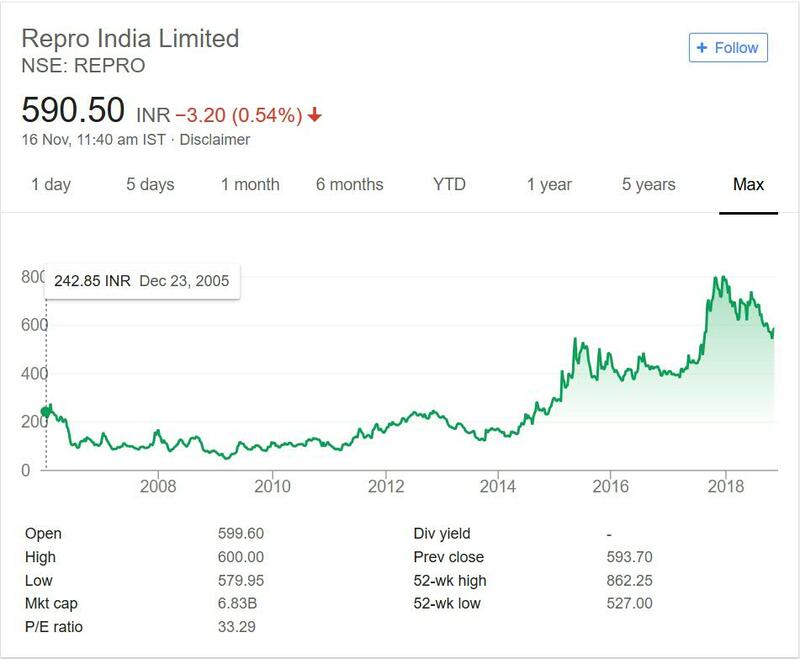 Below image shows share price performance for Repro India since IPO days. It will give you an idea how well company has performed over the years for investors. Repro India debuted exchanges in year 2005 at around 250 mark. The stock under performed after listing for next decade. That is for next 9 years company was not able to surpass 250 mark. For most time the prices were able to touch only 200 or trading below 200. This was indeed patience testing for IPO investors. Note company had rise and dip (slow) in these ling 9 years. The recent market rally helped company moved past the 250 marks and reach past 850. But would the company have gained so much if market was not that frenzy is the question. The stock does not pay any dividend in this time period as well. So if you look at price performance along with dividend yield then company has not performed as per good company standard. Repro india is in portfolio of Vijay Kedia. The company is in niche segment but I have some doubts on area of operations. The content and books are transforming into digital form. People are now consuming more digital content than the physical book. This concern is addressed by the Company as well in form of Rapples. But Kindle is one indirect competitor of it. The only difference in Kindle and rapples is pre loading of rapples. School can also control content on Rapples. Personally looking at the performance of the company in past I am not too convinced for Core business. The future growth of company will come from Digital landscape. It should be interesting observation on how well company promoted and was able to penetrate market with digital content. I am not interested in the company due to risk associated with it. Once the company has adopted and started performing in changed landscape then it would be worth considering. I am not convinced with this stock pick due to risk and past performance of it. In case you are interested then you can add it to your stock watch list and track the performance.